Zomato took over Urbanspoon recently and you will realise that all the restaurant reviews that were on Urbanspoon has been migrated to Zomato. It is essentially still a restaurant review site, but with a lot more great and innovative features, which deserves another proper blog entry on its own. 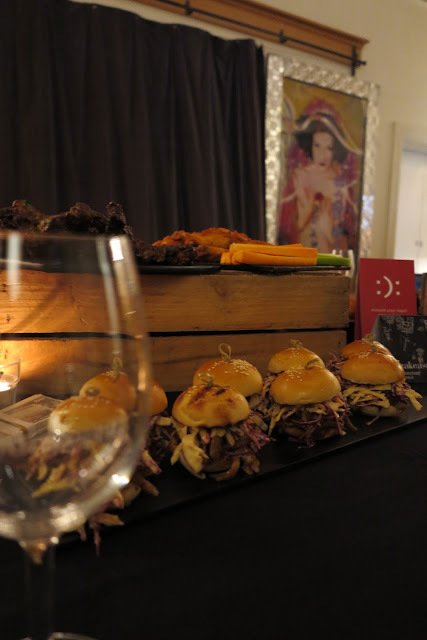 Anyway, Zomato is very committed in fostering a good relationship with food bloggers, hence #zomatomeetup events where food bloggers get to check out cool food places in town, in return the restaurant that hosts the event gets some coverage and publicity out of it. Win-win, no? 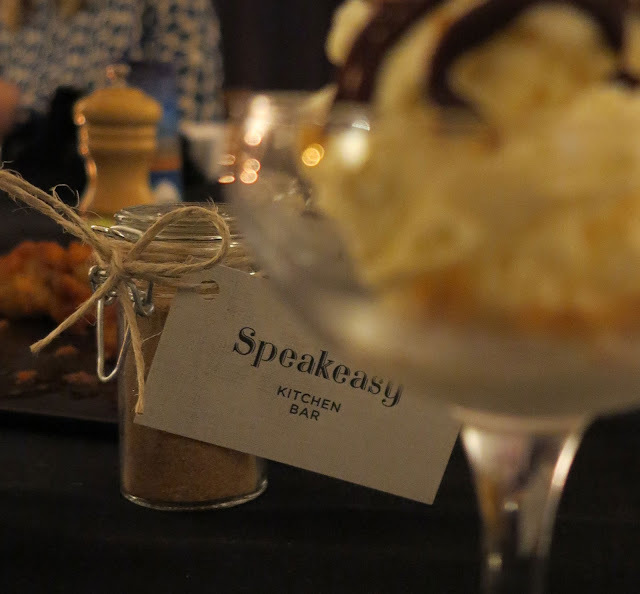 The latest Melbourne Zomato Meet Up was held at Speakeasy Kitchen Bar, located on the trendy Chapel Street in Prahran. 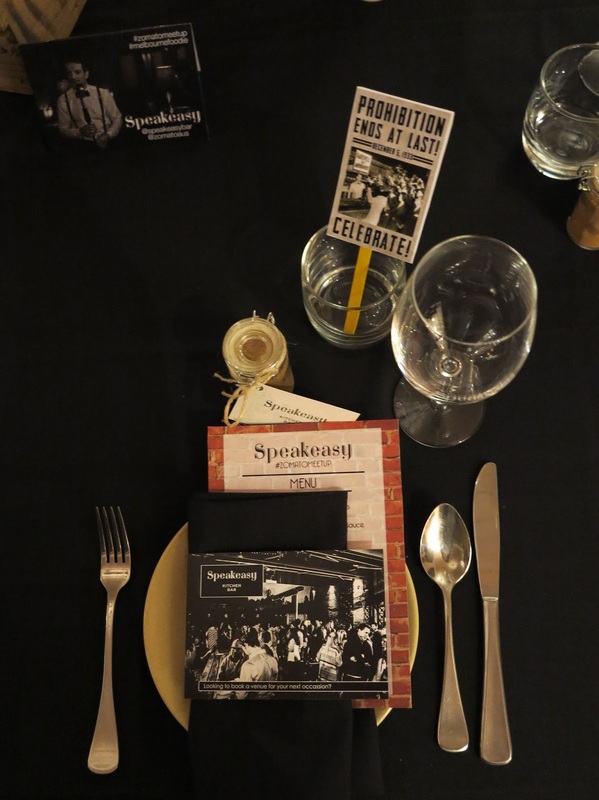 Created as a homage to the speakeasy culture that flourished during Prohibition America back in the 1920s and 1930s, Speakeasy was cleverly tucked away with the subtlest signage. 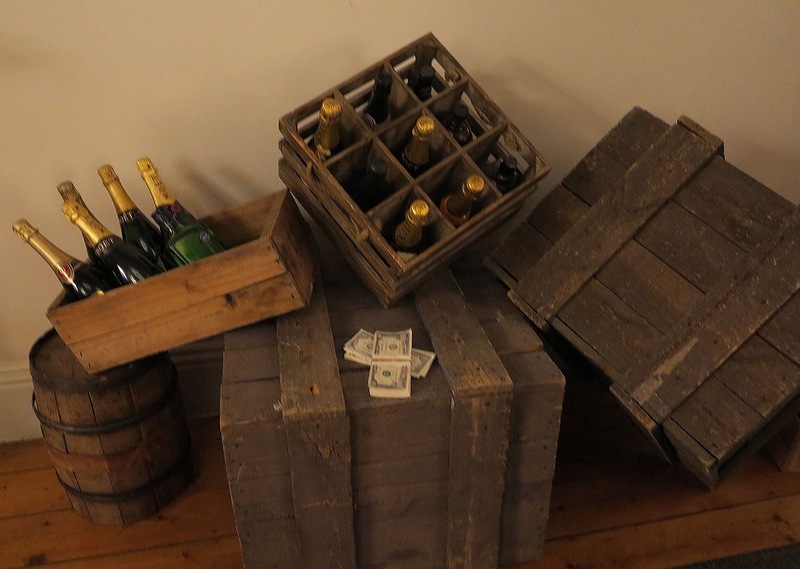 After pushing through the rustic brass door, I was welcomed by a warmly-lit area with wooden wall panelings and tables. It was so inviting after walking in the cold. Upstairs, the open bar and lovely Speakeasy staff was behind the bars, already serving us the first round of drinks (I kind of made it sound like we were raging alcoholics. But trust me, everything was very civilised). I noticed the bar area was tiny, there were heavy drapings around, and the obvious absence of tables and chairs. I assumed it was a cocktail affair, but a moment later Jacqui pulled open the heavy drapings and revealed a beautiful dining setting: It was a beautiful room with gorgeous wooden floor paneling, rustic brass chandelier and a long table set to the Prohibition theme. 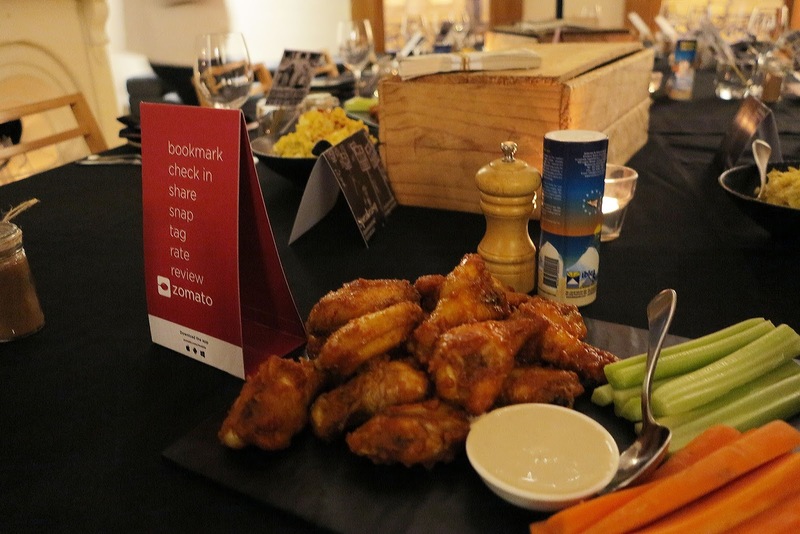 OK, maybe I'm not a Buffalo Wings connoisseur, but Speakeasy's Buffalo Wings was to-die for. I never knew blue cheese sauce can taste so delicious! It was soft, succulent and flavour-some. American-style ribs are always slow-cooked which resulted in a glazed/caremelised top and sensational, falling-off-the-bone soft and juicy ribs. Speakeasy's ribs were exactly that - not to mention the distinct smokey flavour too. It was the perfect comfort food for a cold night. The buttermilk bun was soft and sweet, and the cajun mayonnaise packs a good punch of heat. The combination just makes for a a perfect mini-burger. 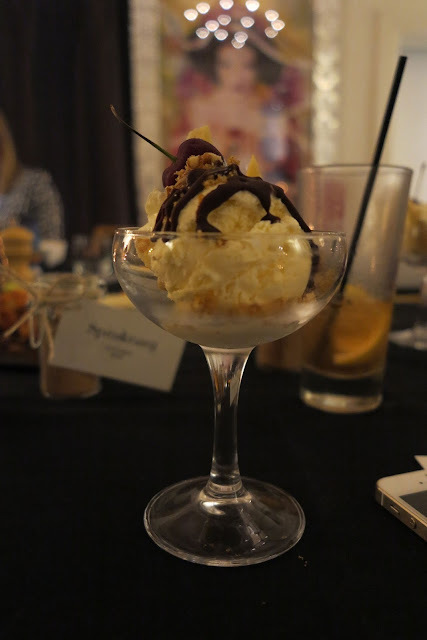 Dessert was quintessential American diner: Mini banana splits served in a dessert glass. After a few hours of good food and making new friends, it was back in the cold. But we did not leave empty-handed: Jacqui has kindly given each of us a small jar of dry rub so we can recreate Speakeasy's Sticky BBQ Pork Spare Ribs at home! We also left with a doggy bag, which delighted Steven endlessly. It was a lovely experience to meet other food bloggers, the wonderful people behind Zomato and Speakeasy Kitchen Bar. I must say, even after nuking the takeaway in microwave, Steve loved every bit of the Buffalo Wings and Buttermilk Crispy Chicken sliders. That is indeed saying something about the food at Speakeasy Kitchen Bar. I would definitely revisit the place again soon! Great post Sammy! Was great to meet you too. I'm still dreaming of those lobster mac and cheese balls!